Eindhoven is one of the five nominees to become best Cycling City of the Netherlands in 2014. 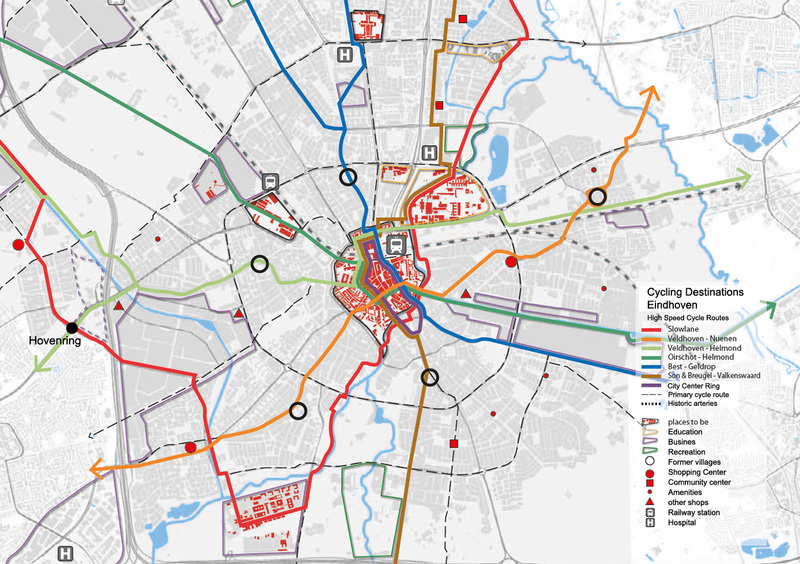 Chosen from a long-list of 19 municipalities, these five municipalities compete to take over the title of current best cycling city ʼs-Hertogenbosch, which was elected in 2011. I will make a small portrait of all five nominees and in reversed alphabetical order Eindhoven is the fourth after Enschede, Velsen and Zwolle. The Eindhoven Hovenring keeps drawing most attention. I have written about Eindhoven several times before. Its best known cycle landmark must be the Hovenring. A spectacular piece of cycling infrastructure even for the Netherlands. So at first you might think the jury fell for something big, but fortunately that proved not to be the case when I visited the city. Eindhoven is the 5th largest city in the Netherlands with a population of 220,000 in the city and about 440,000 in the agglomeration. The city grew most because it was home to multinational Philips since its founding in 1891 until 1997 when headquarters were moved to Amsterdam. And the city grew because of Philips in the most literal sense: the company built an entire village with houses for its employees. Many of my relatives worked for Philips since my mother’s side of the family hails from the Eindhoven region.The letters in the name of the well-known football club PSV Eindhoven stand for Philips Sport Club. There was more industry in Eindhoven; tobacco, textile and the city even manufactured cars. But in more recent years DAF has become a brand that only constructs trucks. Nowadays Eindhoven is a high tech city, with a so-called “brainport” which, according to the Intelligent Community Forum (ICF), was the world’s smartest region in 2011. The Financial Times ranks Eindhoven in third place after London and Helsinki, in the overall ranking of its Foreign Direct Investment Index (fDi index). The old Philips factory buildings (right) blend in with modern architecture in the city centre of Eindhoven. Eindhoven has a bit of a reputation to be a city for cars. The city centre shopping area is completely car free but right around it the city centre ring is a giant multi-lane one way gyratory. Around the station area the streets for motor traffic are just as wide as they are in Rotterdam. That may be because Eindhoven was also heavily bombed in World War II and it was reconstructed in a similar way. But it has a completely separate cycle network under this network of big roads for motor traffic with cycle tracks that are also extremely wide, just as the roads above them. As one of the few cities in the Netherlands, Eindhoven has an airport. When I went to Budapest in 2012 for a presentation on Dutch cycling, I cycled to this airport to get on the plane. The cycling parking facility has increased since then, just as the airport did, but it is still not very big and not indoors, something the local branch of the Cyclists’ Union does not think highly of. And a changed policy in which cycling is taken into account from the start of plans and not as an afterthought. I fully agree with their first complaint. Compared to many other Dutch cities I cycled in, the waiting times at traffic signals in Eindhoven stand out and not in a good way! But their last complaint seems to be addressed in the new (2013) mobility policy of the city Eindhoven op Weg (Eindhoven en Route). In which the city paints a picture of what the mobility should be like in the long term, in 2040. 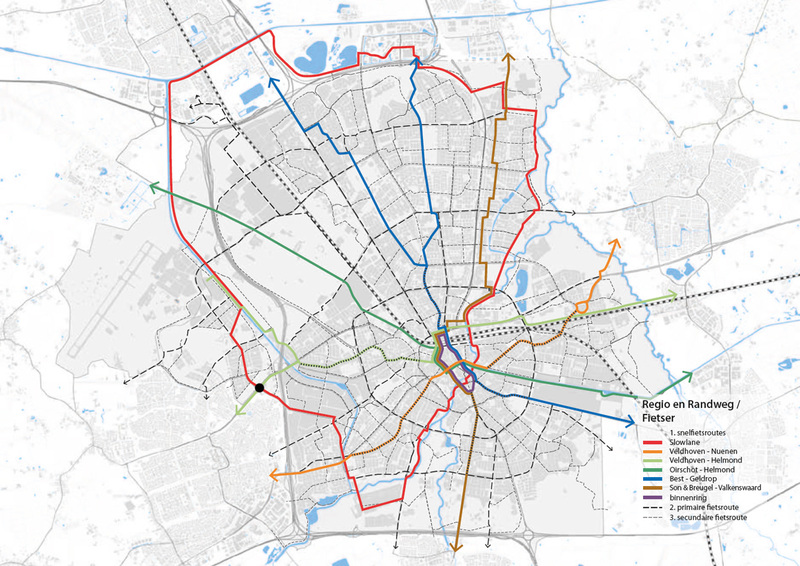 This map of the transport vision of the city shows destinations reachable by bicycle and the main routes to them. Left I put in a black dot that shows the location of Hovenring. The city writes it wants to be a good place for business as well as people and also that it wants a sustainable transport system. In the English summary we read. This all comes together in the Eindhoven en Route motto: ‘People and places sustainably connected’. From the point of view of mobility, the principle of ‘slow motion – fast forward’ is being applied. Wherever possible, pedestrians, cyclists and public transport will be given primacy. With “slow motion” cycling is particularly meant. Hence also the name “Slow Lane” for a long circular fast cycle route that connects brainport, airport and city centre. But apart from that unfortunate name, this motto sounds excellent for cycling. The the city centre ring is really only convenient for motor traffic. The space is mainly used for the car lanes (although with cycle tracks along side), making it a very inconvenient place to be for people. In the vision for the future this will change dramatically. 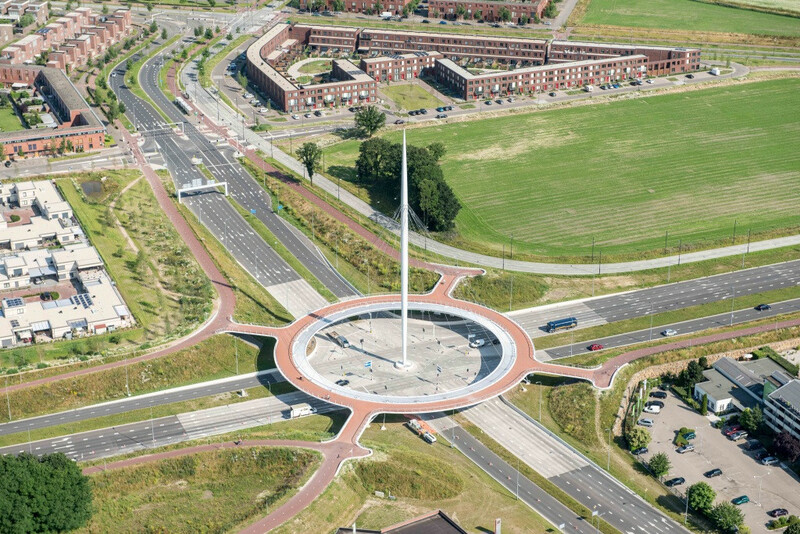 The more elaborate Dutch version of the vision has a text on the wide city centre ring for mainly motor traffic. The way it is now constructed, the city centre ring no longer suits the versatile city we want to be. A big improvement can be achieved by using the city centre ring differently. The space is now mainly used for motor traffic and public transport. In the versatile city this space will be used in a notably different way and it will mainly be allocated to people walking and cycling and used for high quality public transport. The city and regional cycling network. In colour the main high speed cycle routes in dotted lines the primary and secondary cycle routes. The city centre ring is in blue and orange/green. The (second) city ring is a dotted circle. The grey roads wide around the left hand side of the city are motor ways. I put in the black dot left to indicate the location of the Hovenring. About cycling the vision reports the following. Cycling is taken for granted in such a way that we are hardly aware of the consequences this has on our culture, our city and its layout. A quarter of all journeys from, to and in Eindhoven are taken by bicycle (2012). The locals themselves chose the bicycle for 40% of their journeys. The bicycle is also important in combination with other modes of transport. Almost a third of the 55,000 train passengers use the bicycle as a means of transport to reach one of the Eindhoven train stations. Although many perceive Eindhoven to be a larger spread-out city, the distances are relatively short. The area within the ring is quickly crossed by bicycle, in about 12 minutes (for 3 kilometres). From the city centre the East (Tongelre) and the South (Stratum, Gestel) of the city can be reached in a comparable time. For the North (Woensel-Noord) and West (Meerhoven, Veldhoven) it takes about double that time. So within roughly half an hour all destinations in the city can be reached by bicycle. In addition almost half the commuting distances are under 7.5 kilometres (also in the future). But half the journeys under 7.5 kilometres are made by car. So there is enough potential to stimulate the use of the bicycle even further. This certainly sounds like the bicycle is no longer taken for granted by the city. It also speaks of building more fast cycle routes and more bicycle parking facilities. And if we look what is actually happening in the streets we already see the results of this attitude. Oirschotsedijk was a road with a separate cycle path, but the cars -most of which were through traffic- were sent on a detour and since November 2013 the main carriage way is now mainly for cycling. Only cars that really need to be here are allowed to use this cycle street as guests. This is part of a new green zone with a cycle route all through the city. Nothing that was built recently stands on its own, it is all part of a bigger plan. When Google was here to take pictures for StreetView in 2009, it was still a through road, so that provides a perfect ‘before’ picture. 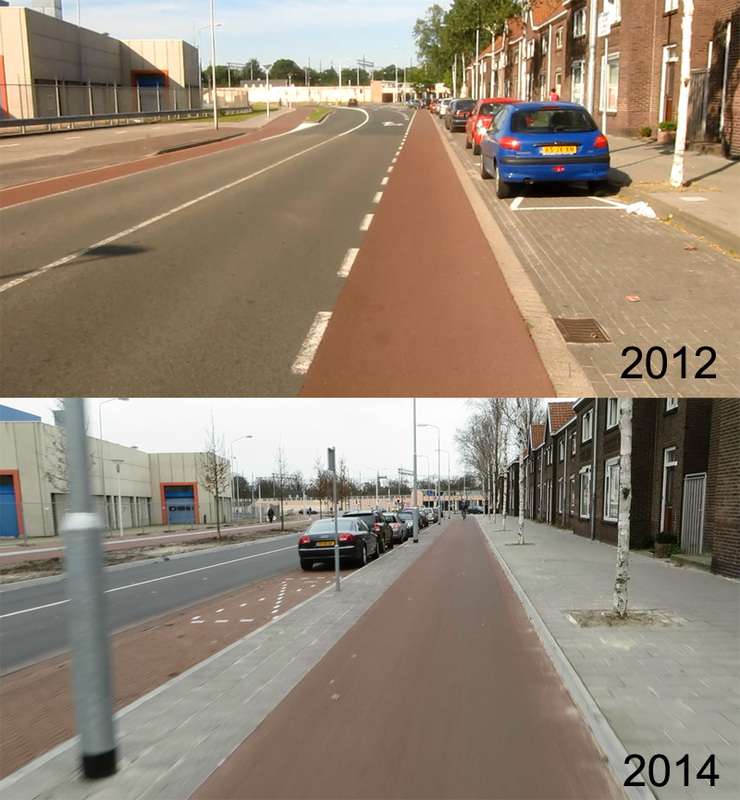 Since November 2013 this road called Oirschotsedijk has become a cycle street where cars are guest. 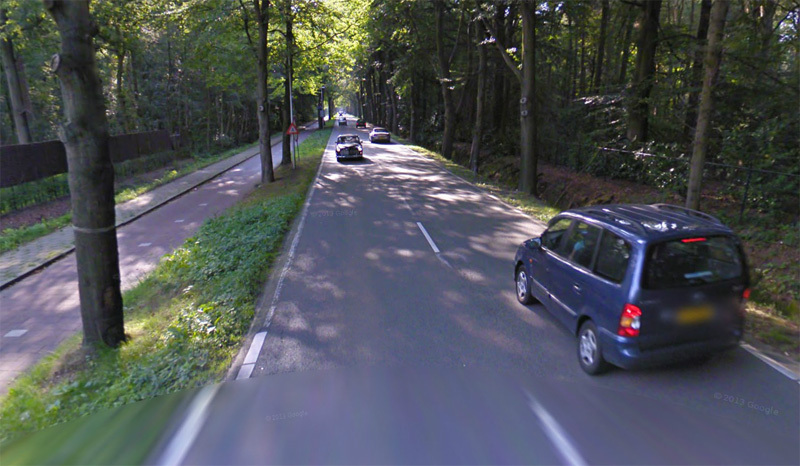 When Google photographed Oirschotsedijk it was still an “old-fashioned” through road with a separate two-way cycle track next to it. If you look at the trees you can recognise by their gnarls that it is really the same spot. In the Glaslaan, where you could see cycle lanes as recently as in 2012, I now found protected cycle tracks. 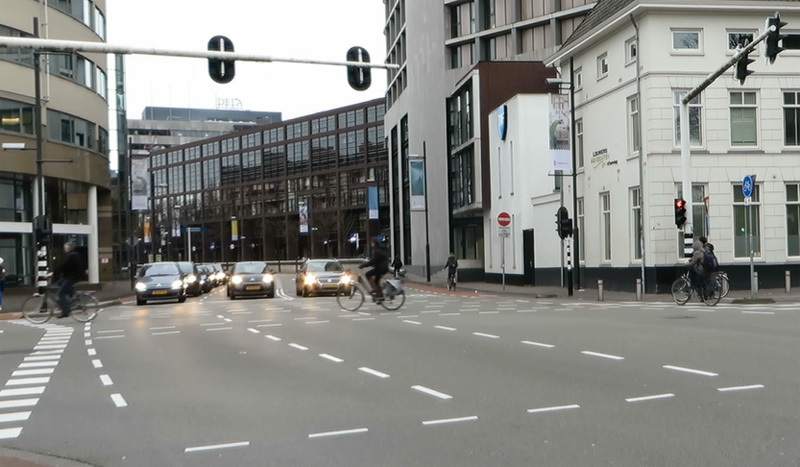 Eindhoven has also constructed cycle streets. Some of which seem to work better than others with regard to the motor traffic guests. A main shopping street in the centre that became a cycle street recently, was so busy with wrongly parked cars, that it became hard to cycle there on a Saturday. Glaslaan in 2012 and 2014. From a cycle lane in the doorzone to a protected one way cycle track at both sides of the street. The birch trees to the right remained in the same place. Only the street layout was changed. On the left hand side new trees were planted. So, the 2012 Hovenring is certainly not standing on its own. 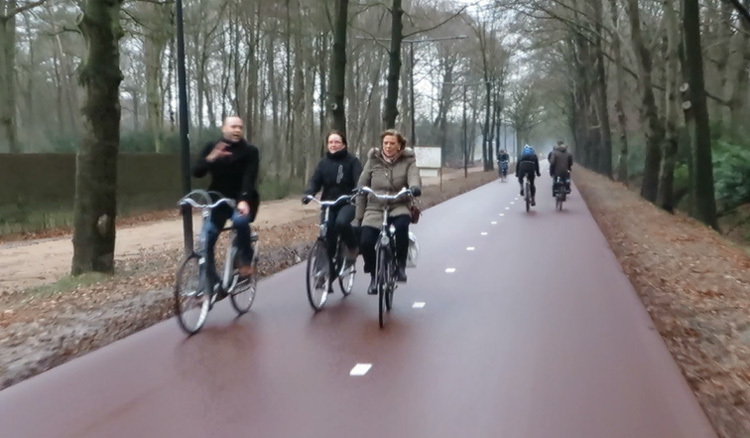 Eindhoven has taken concrete action to improve cycling with very high quality infrastructure in very recent years. On top of that the long term mobility vision for 2040 looks very promising. So it is not so surprising after all that this city is one of the nominees to become best cycling city. In my opinion Eindhoven has an unexpected good chance to win. If this video doesn’t play (people have reported they have trouble playing it) then you can try the Vimeo Version. Apparently a singer/songwriter, famous in his own country, grew up near the Phillips Electronics factory and starting at the age of seven, he was hospitalised with pneumonia. In spite of this, he was a smoker, in this case of cannabis. He died the year after this blog entry was posted after being hospitalised seven times. Just bicycled there this Saturday- WOW! 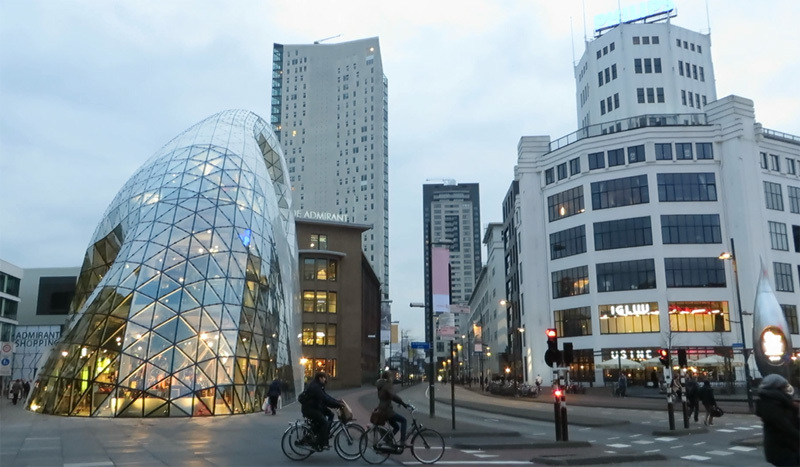 I have been in Belgium and Netherlands all summer and enjoyed the amazing cycling (I live in Fort Worth, Texas); however, I have never seen anything like Eindhoven. Just amazing, terrific, enjoyable, and worth a visit (or multiple visits) just to experience the cycling access. I keep wondering where the space was obtained for bikeways on main roads in Dutch cities. Was this often accomplished by taking away on-street motor vehicle parking? Is the parking then provided a short distance away like it is for large shopping malls in the U.S.? It varies, sometimes it’s this, sometimes it’s that, sometimes you can’t tell, because the whole street layout is being changed in the process, often the space is simply already made when the road is built. I don’t know about the past, but currently it is only rarely parking space, because cycle tracks are usually built along main roads, and main roads usually don’t have parking lanes anyway. Oh, in the case mentioned in this article (with the two pictures), what got lost was a bus lane that got out of use because the bus route had changed. You can see it at the left of the 2012 picture, but it was already out of use by then (as can be seen from the fact that it does not continue in a way that can be navigated with a bus, it used to continue further on, but the crossing was changed before the rest of the street). The video is playing much better now. Thank you. Why is De SlowLane named that? Is that a Dutch term, or is there another reason for it? Because it is part of the plan: “slow moving, fast forward”. Also in the Netherlands (and in Dutch) motor traffic is called “fast traffic” while cycling is referred to as “slow traffic”. They now translated that and used it in this name in English. But it sounds very strange in English, so it is a most unfortunate name for a “fast cycle route”. My kid visits ASML in Eindhoven several times a year from Phoenix AZ. Yeah, is that new for you? I have that all the time with YouTube, with other videos I mean, and then indeed a day later it does work again. I haven’t had it with this one though. I have subtitled it (for which you need to see it a lot of times) and just started it 3 times in 3 different browsers without any problems. So I’d say do try again. If it’s any consolation: on my computer the video refuses to start from inside the blog but works fine from YouTube (https://www.youtube.com/user/markenlei). 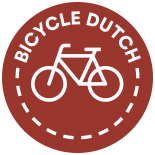 This entry was posted on 6 March 2014 by Bicycle Dutch in Original posts and tagged Eindhoven, Fietsstad.